Eastern Box turtle (at least I am pretty sure...). I am starting to put my birthday present to good use. Are you tired of turtle pictures yet? A group of Painted Turtles. 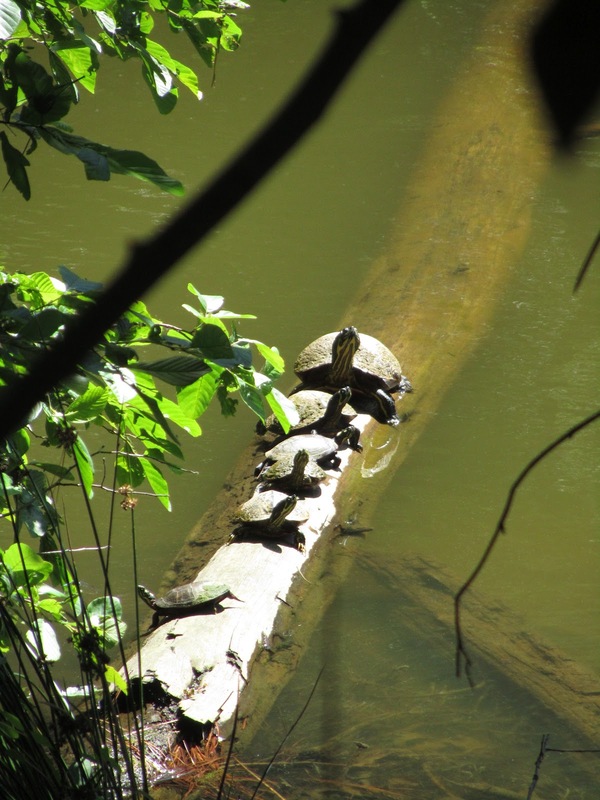 I thought this scene today on the record holding turtle log was humorous. The blue heron deciding which tasty turtle will be his next mid-morning snack. Summer is in full swing, and with it, the dragonflies are out in mass. Keith and I are loving the crazy variety here. It is not uncommon for dinner conversations to include descriptions of the lovely dragonflies we have seen that day. We particularly like these (I am pretty sure that this one is a female Common Whitetail) that look at first glance as though they have flags instead of wings. I have yet to get a decent picture of the showy and common Northern Cardinal, but this Eastern Tanager posed nicely for me. As did this goose. Charlie LOVES watching the geese and my efforts at teaching him "geese say honk! honk!" gets him laughing every time. Well this may be my blog but I know what you all come here to see, and if you made it this far you deserve to get what you want. So I will end with a picture of Charlie and the geese.